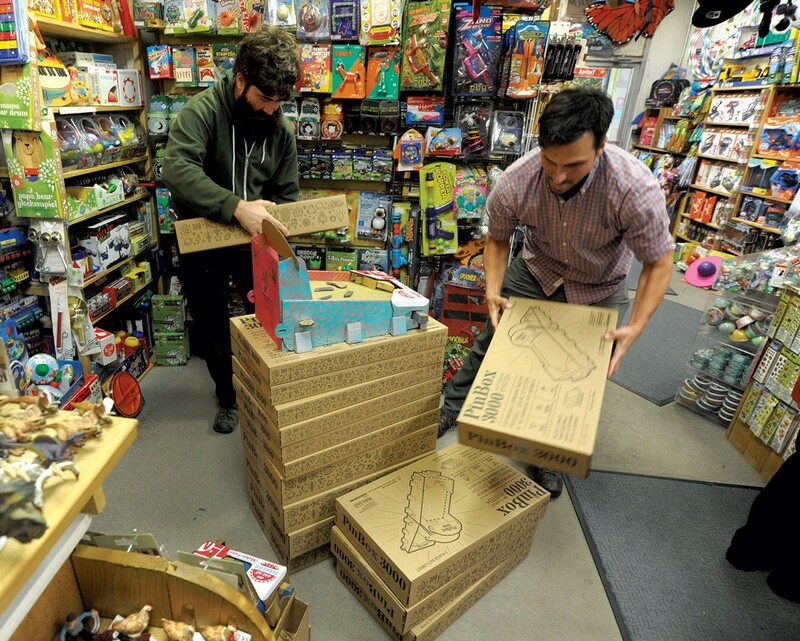 The Art of... Cardboard Pinball | The Art Of | Kids VT - small people, big ideas! Kids in Montpelier's River Rock School after-school program tinkered with ramps and bumpers on a recent November afternoon. They were designing a familiar game: pinball. But theirs were far from the machines found in modern arcades. Rather than electricity, these pinball machines were powered by imagination. And instead of metal and glass, they were made out of cardboard. 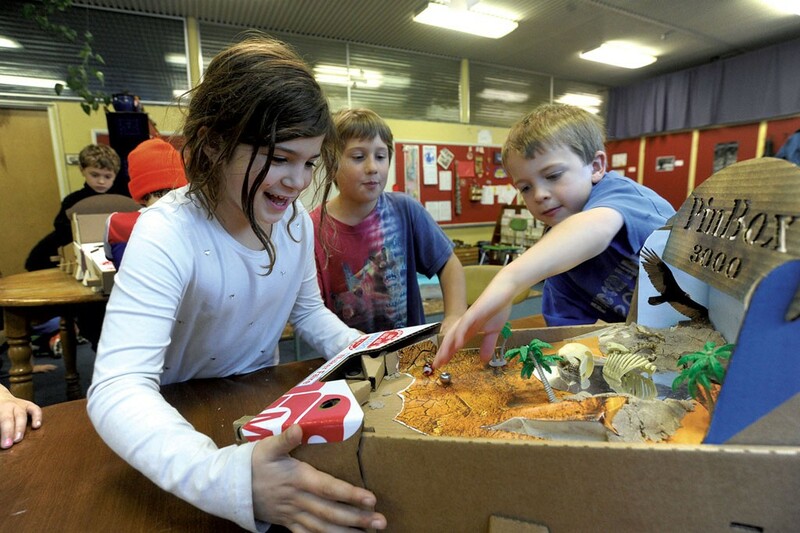 The elementary school students were playing with prototypes of the PinBox 3000, a low-tech invention developed by Montpelier residents Pete Talbot and Ben T. Matchstick, who describes the PinBox as the "X-Box of cardboard." It comes in a kit containing 12 flat "slides" of die-cut cardboard ready to be punched out along perforated lines and assembled. 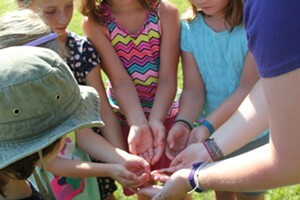 Step-by-step instructions are designed to make it doable for kids ages 7 and up. After assembly, the working pinball machine is complete with flippers and a rubber-band-powered ball-release mechanism. The kit includes two playing surfaces, or play boards, which are intentionally left bare to allow for customization. Creativity is encouraged. An instruction book offers tips such as using a Popsicle stick for a bumper, bending cardboard into ramps or using an empty creamer cup to catch the ball. Talbot says he hopes the game will inspire players to release their "inner MacGyver." Sure enough, the students used glue guns and found materials including bottle caps, straws, Popsicle sticks and cardboard to construct their own play boards. Union Elementary School first grader Liam Noyes glued a large sign on his play board that told players to send their ball through an opening for a prize; however, there was no prize. "It's a trick!" he said, laughing, "just to get people to do it." Second grader Dillon Nicholas, also from Union, designed a board with three "security robots" repurposed from found plastic objects. He hammered nails into the board at different spots to make obstacles for the marbles. Owen Lathrop, a fourth grader from Union, said he especially liked the Battle Mode feature, which links two PinBox machines together so players can attempt to send their ball through their opponent's board. In this version of the game, whoever loses their three balls first is the winner. The PinBox creators themselves have been on a winning streak. The pair, who call themselves "professors" of the "Cardboard Teck Instantute," are experienced cardboard creators — their past work includes a giant Star Wars Imperial Walker and an arcade for a puppet show. They've also made pinball machines for various parties and venues, including the Human Powered Carnival in Glover and Montpelier's now-closed Langdon Street Café. In January 2015, they were offered a monthlong residency at the Generator maker space in Burlington, where they honed their game system. In June, they were invited to participate in the first-ever National Maker Faire in Washington, D.C. And in September, they trekked to the World Maker Faire in New York, where they received numerous blue ribbons for their cardboard pinball "art-cade." An article on the Make: website noted their achievement: "Simple and complex at the same time, making a cardboard pinball [machine] looks almost as fun as playing one!" The inventors officially launched the PinBox 3000 in November, in time for the holiday season. It can be purchased online and at Woodbury Mountain Toys in Montpelier. The game isn't just for kids. Jokes Matchstick: "Given a little time and patience, even a 30-year-old could put it together." The PinBox 3000 is available online at makershed.com or pinbox3000.com, or at Woodbury Mountain Toys in Montpelier. The standard system is $49.95; Battle Mode, which includes two PinBox 3000s, is $89.95. A discount is available for educators.